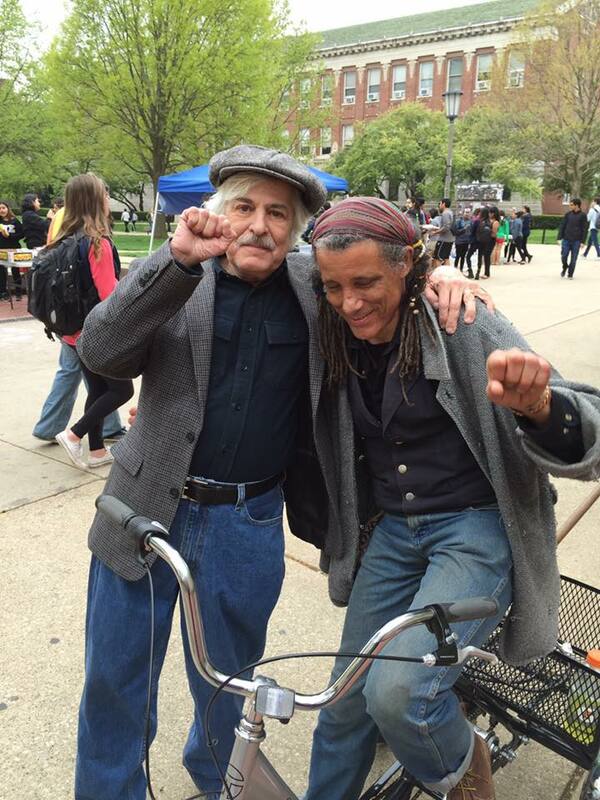 Gene Vanderport (left) at 2016 May Day rally with the Public i’s Dave P.
It is difficult to write about an untimely death of someone whom one has known for almost half a century. Gene was my student, my comrade, and my friend since the late 1960s. Only a couple of years after my arrival to teach political science at the U of I in 1965, a young, bright-eyed, highly intelligent and articulate student showed up in one of my classes. It was Gene. He was living in the Danvillle Collective and driving in to take his classes. The Collective was a group of politically radical young people who were living together at a time when such communes existed all over the country. Gene was a very committed democratic socialist, a socialist in the mold of Gene Debs. He and I shared that ideology. While Gene was radical in his politics, he stood out as being more culturally conservative than many of his radical peers in both his dress and his aversion to drugs. Gene was very interested in the idea and practice of worker control over the workplace. So, one day he came to me and proposed an independent study course in which he would go to Yugoslavia and observe and interview people who were actually working in factories in which workers were in control. This made Yugoslavia unique among the communist countries of Eastern Europe. I thought this was very gutsy for someone of his age who had never been out of the country before. I agreed to it and it turned out to be a wonderful, broadening experience for Gene. It reinforced his conviction that workers did not just need to be objects in a factory production line as portrayed in Charlie Chaplin’s Modern Times. Instead, they had the knowledge, experience, and commitment to run their own enterprises. He became a proponent of both producer and consumer cooperatives that are not uncommon today. Gene was one of those great student protesters of the 1960s. He opposed the war in Vietnam and the treatment accorded to Cuba by the US government. But he was never just negative. He always envisioned, and fought for, a democratic socialist future in the States. After graduating from the University of Illinois, Gene took a job at the Veterans Administration Hospital in his native Danville. There he became active in the local of the American Federation of Government Employees and rose to its leadership. He was so successful in that role that he was called to its Washington office to serve as a national organizer, and then as its National Organizing and Political Director. Anyone who knows anything about unions knows that the job of a traveling organizer takes an enormous toll on a person’s mind and body. So, after a number of years doing that, Gene looked for a position that involved less travel, but also that permitted him to live in a community in which one could develop roots. He looked back home. He took a position as the Director of the Illinois Education Association in this area. This permitted him to be close to his widowed mother who lived in a house in the woods near Danville. They called it the Green Cocoon. Gene Vanderport holding a GEO banner with Kerry Pimblott. While back here, Gene, along with others, including myself, created the group Socialist Forum. Gene and I also served as coordinators of the Living Wage Association of Champaign, which was successful in getting living wage policies adopted in the city of Urbana and Champaign County. 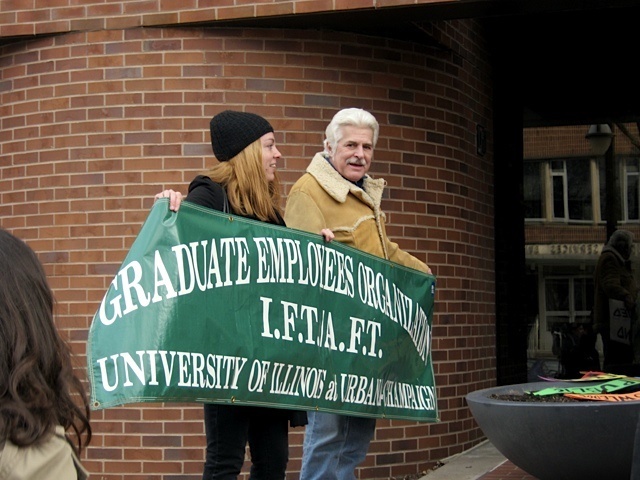 Gene was also active in the Labor Coalition at the U of I. We, and Gene’s wonderful wife, Germaine Light, were also very active in the Central Illinois Jobs with Justice Coalition. We engaged in many strike and lockout support actions together. Gene was arrested in a sit-in supporting the Staley (now Tate and Lyle) workers in Decatur. That arrest became a badge of honor for him. Gene and I were very close. He used to call me Dad. And, since I had no other sons, he became kind of a son to me. He would always listen to what I had to say, and sometimes he would do what I suggested. But Gene was his own agent, a cooperative comrade in fights for social justice. The labor movement lost a staunch fighter for workers’ rights. I have lost a “son,” a student, comrade, and friend over a span of over 50 years. Gene, his wife Germaine, my wife Jane and I liked to go to the Gene Debs dinners in Terre Haute. Debs was hero to us, a democratic socialist who had to run for the American presidency from a jail cell because of his opposition to U.S. entry into the First World War. Nevertheless, Debs got almost a million votes. I am so glad that Gene Vanderport lived to see Bernie Sanders gain so many backers as an avowed socialist. We never thought we would see the day that this would happen, that the idea of socialism would no longer be taboo in American politics. So my son, one more thing that I would advise you to do. Tell Gene Debs all about it up there. Tell him how so many young people supported this socialist. Make his day in eternity. Love, peace, and justice be with both of you. Till we meet again. 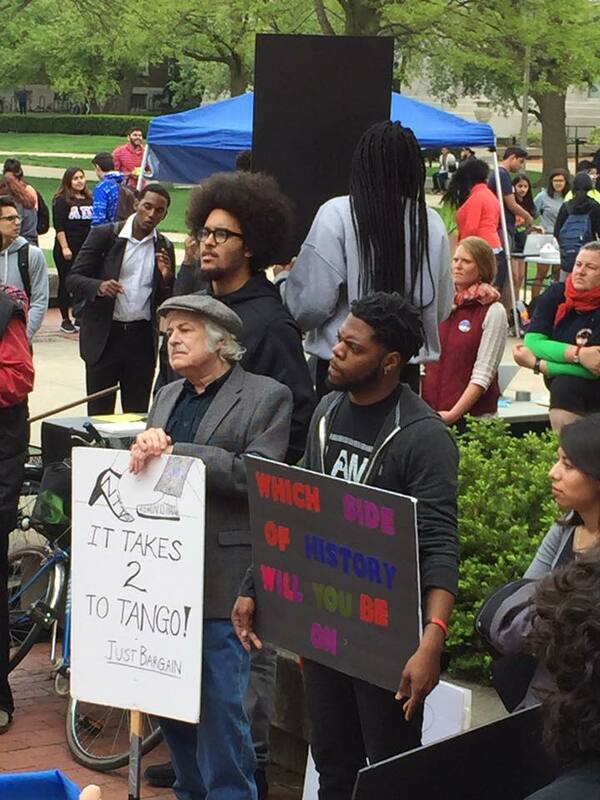 Gene with members of Black Students for Revolution at 2016 May Day rally on U of I quad. This entry was posted in Human Rights, Justice, Labor/Economics, socialism. Bookmark the permalink.